Summary: Ground power units require routine maintenance for optimal performance. Over time, ground power units tend to lose their kick that they used to provide back when you first got them. However, in order to combat this, routine maintenance is required. This guide will showcase some tips on what you can do to keep your GPU clean and problem-free. One of the most important components of a GPU is the cooling system. The coolant level should be kept full with both antifreeze and water mixture (at a 50/50 ratio). Also, be sure that the radiator cap is set to the correct pressure for the system and is free if any cracks in the rubber seal. Inspect the chassis and the GPU running gear. Brakes should be checked for proper operation – if you’re utilizing a major type of unit. Also, all wheel bearings should be cleaned and inspected after 2,000 hours of use. Don’t neglect these as they’re critical for the operation of your ground power unit. The generator system needs to be set to the exact specifications or the aircraft will not accept power. Depending on the model of your GPU, be sure to adjust the parameters as you see fit. Also, keep an eye on the voltage levels. If they’re too high or low, the safety relay within the aircraft will open, causing the GPU contactor to open. It’s important to remain cautious when it comes to tinkering with the generator. The wrong specs or settings could cause permanent damage to your aircraft if you’re not careful. 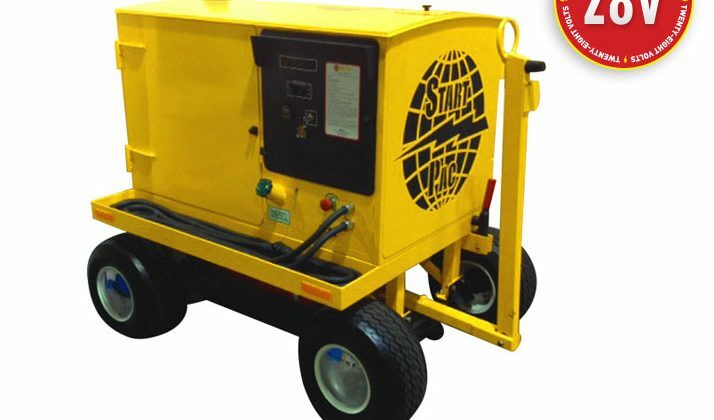 Blog submitted by Start Pac: For all your portable power pack needs, visit the experts at Start Pac.